Jiah loved two things in her Life. Her oven and her treadmill. Baking and Burning, that’s the pet name she had given them. She fell in love with these when domestic boredom visited her. After many years of a nine to five job, Jiah walked up to the altar hoping to taste domestic bliss..But in time she realized it was many empty hours that she had adopted. I will take to cooking, she decided. Let me discover sushi, pasta and frittata, she thought. She spent hours reading cook books, blogs, and watching cookery shows on TV. But being of sweet tooth, it was the baking that won her heart. The melting of chocolate, the mixing of the cocoa, flour, sugar and the yummy looking result of these had her hooked. The oven was already there, a wedding gift. She ordered the kitchen aid, and purchased her ingredients from the gourmet stores.And soon she was on roll. She started with pinwheel cookies, followed it with brownies and biscotti and then attempted the cakes. Black forest cake, fruit cake, pound cake and when her house smelled of the molten chocolate cake. “Nirvana is this!” She exclaimed. “I am in love!”Jiah said. “Yes, indeed you are,” Rahim her husband agreed, looking at the baking books piling up, the kitchen being filled with baking accessories, and Jiah spending her time more with these. He was kind of relived also, as Jiah’s incessant phone calls to him asking when he is coming home, and her often squeal of “I am bored “had died a natural death. And he had nothing to complain, as the pantry was always filled for him to eat, and he enjoyed the praises and accolades from families and friends of Jiah’s cakes and bakes. ‘Boy Jiah, we never knew you had it in you,” said her family chewing her frosted cupcakes. She would pack her cakes and biscuits to her neighbors and relatives. She was thrilled when Asha of the first floor asked her if she could make her the molten chocolate cake as she wanted to gift them for her best friend’s birthday. 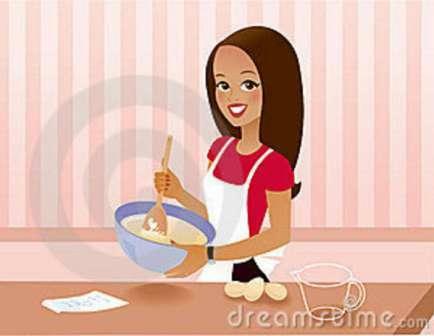 And when the newly pregnant Yasmin called her one day and asked her to make her the buttery pound cake as she was having a craving for it, Jiah’s happiness knew no bounds. One fine Sunday morning, Jiah read in the Sunday Metro that Monsieur Leonardo, the Famous French Pastry Cook, was visiting a reputed 7 Star Hotel for a 3 hr cooking demonstration. It was an unexpected visit, the Monsieur was traveling to Japan and India was a Stopover in the last moment and hence there was no previous notice. So whoever wanted to attend, had to reach the Galleria by 4 in the evening, said the advertisement in the news paper. Jiah jumped from the sofa, spilling her tea and shaking the tea pot that was near it. Rahim was sleeping away his weekend blissful sleep. Jiah rushed to her cupboard to look into what she will wear. "Hmm, Let me have a look at the party skirts that I have," Jiah thought. During her working days, Jiah would usually wear a party skirt and a top for office parties. But after Marriage, she found herself more comfortable in the lovely shalwar and chudidars that had hit the market. Jiah searched her Wardrobe, she decided on the mango top and the white floral skirt which she had picked up from Zara. She then tried it on. When she pulled the skirt to her stomach she was shocked that there weren't able to come up easily, by some force she brought it to her waist only to face another horror of the buttons ,not able to fasten up easily. Jiah was not speech less. "Oh My God, what has happened to me?" she cried out loud. She looked at Rahim to tell him her agony, only to see him in his blissful surrender. With great disappointment she realized that she won’t be able to wear any of her skirts or tops, which had easily fit her ten months back. The Evening Class was a huge hit. The crowd loved Monsieur Leonardo. Not only was he gracious and spoke with great charm, but the skills he showed them were great eye openers, making the crowd thank their Lucky Stars. The Happiness of that evening made her forget the painful morning. The Pains came back later at night when Rahim and she were sitting out in their Balcony, chatting. Jiah suddenly got up and cried aloud, “Rahim! I have become Fat! And you didn't even bother to tell me"
'Uh, Jiah what did you expect, with all that sugar eating that is going on in here,"Rahim replied. Seeing the hurt on Jiah’s face, Rahim quickly said "We will buy you a tread mill and that will take care of your weight alright." “That's great! Let me google and search for the latest tread mill." And Jiah soon typed on her phone. The Tread Mill was delivered at their home the next week. At first she was nervous, and would feel tizzy at the thought of walking on it. But soon she conquered her fears and got running. Jiah would not miss her time on the Tread Mill as she had began to relish the stamina she developed and the healthy hormones that she could feel coming out. The Tread Mill Run was followed by another 30 minutes of cardio, Abs, and all other exercises that she had searched on the Net and watched. Two sounds became familiar in her Apartment, the sound from the Guest Room which Jiah had now converted to her Gym Room and the sounds from her kitchen. Her kitchen shelves were always stocked with almond biscotti, fruit cakes and chocó chip cookies. It happened on a Saturday evening. Jiah had returned from the grocery, and was stacking the food that she brought in their respective places. The Grocery trip had unusually tired her, so she had taken a short rest and then began the pleasure full chore of stocking each items. This was one of her favorite chores. The fruits and the vegetables were washed many times, and were then placed at their respective places in the refrigerator. She then tackled the pulses and the rice.They were cut open and put in the huge mason jars. Jiah did not like plastic containers. And besides the glass one's looked adorable. The bread flour were carefully opened and placed in its box. The All Purpose flour packet was cut next and smoothly swished into its. Cooking chocolate and vanilla, founds it ways to the shelves above. Jiah then tackled the spices. Coriander, cumin, turmeric, pepper all were cut open and gently poured in their respective bottles.